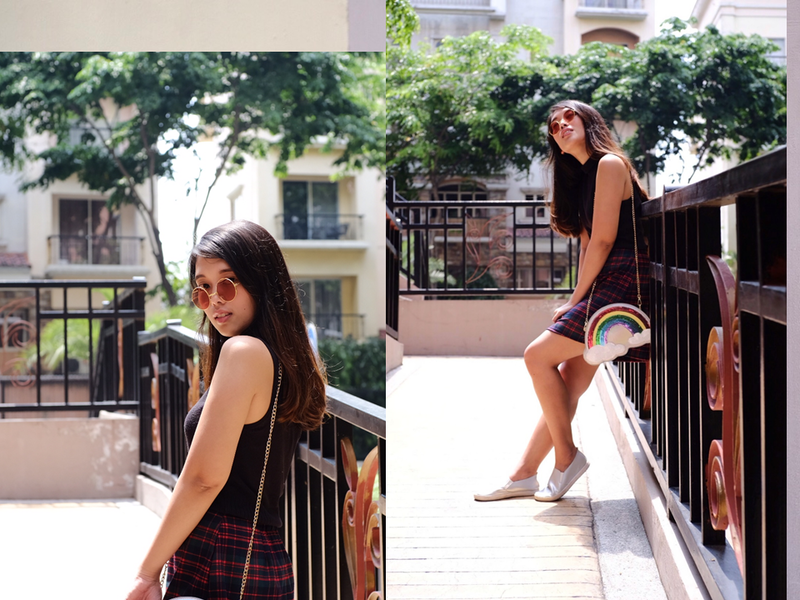 Under this scorching heat, one of the most needed fashion essentials are sunglasses. Wearing sunglasses or sunnies is always a good way to spice up an #OOTD. This Summer 2017, trendsetters have officially slayed the fashion world when they made a comeback with retro tinted sunnies. 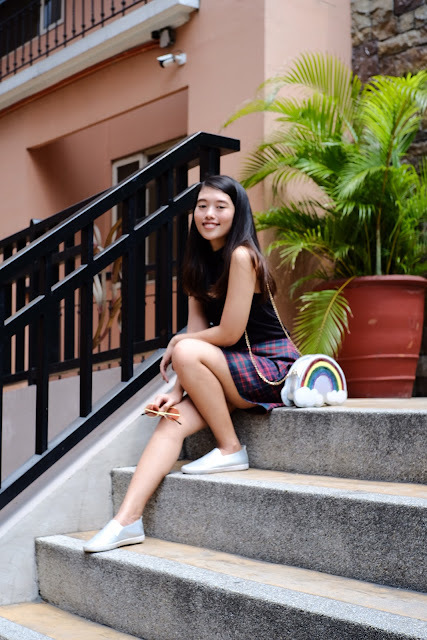 I know black is the not the best color to wear in summer, but I figured I would balance the color scheme with a colorful rainbow sling bag partnered with silver slip-ons. Special thanks to Josamm Felices for being an amazing and enthusiastic photographer! We also have exciting news for you guys, so stay tuned! 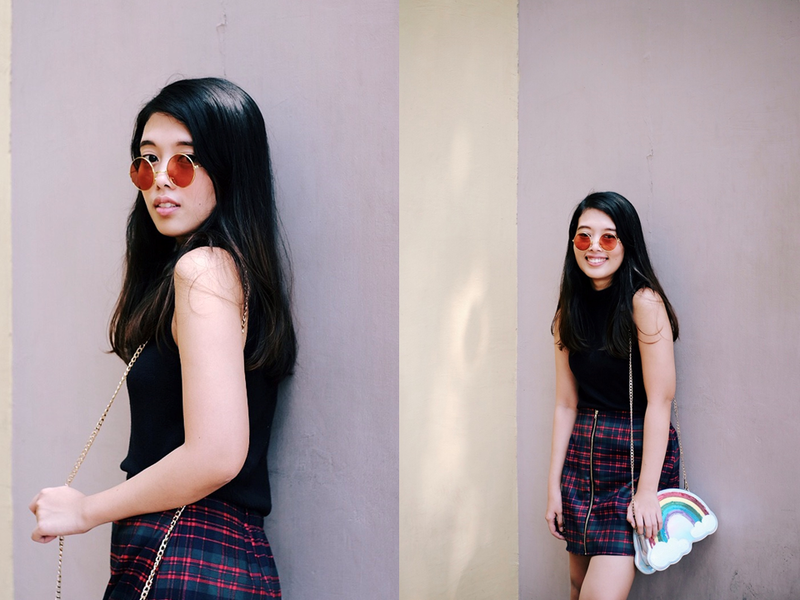 What do you think about the latest tinted sunnies trend? Haha, I'm the opposite! Summer is all year round in my country! I am loving that skirt. It so cute, looks comfy and definitely perfect for summer. and the tinted sunnies? I actually like them! What a great look. My favorite is the purse. I love the rainbow! I do like the sunglasses. Love that era in terms of fashion! Thank you so much! Great post! Love the sunnies on you. They look great! Perfect with your attire. It's a cute outfit.Perfectly goes well with you and gives you a pretty look!The bag is pretty and unique.Love it! I always loved the tinted sunglasses style. I just have never gone for it. But something about those circular glasses I love. The rest of the outfit is great too. You look very beautiful. I absolutely adore how cool and comfortable you look.Something about those tinted glasses and your pretty face makes me smile. They are absolutely gorgeous and look good on you. I wish I could get one for myself too. Your sunnies and rainbow bag make the outfit! I love them both! That purse is breathtaking , you great. I just love anything vintage and that includes the glasses! Always wanted to get a pair, and also the aviators too. Hihi. Love the outfit! I wanna be your photographerrrr~~! hahaha! Love your bag! 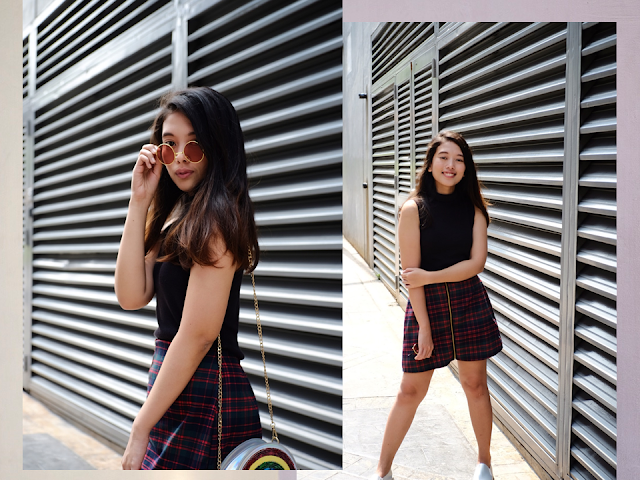 <3 And I agree, sunglasses do spice up your OOTD! By the way, I nominated you for Liebster Award! :) You can check out my post about it here. I look forward to reading your answers! I love your sunnies, but I know hindi bagay sakin yan. Haha! It's kinda difficult for me to look for one na bagay sa face shape ko. I have a small face kasi, tapos ang nauuso now ung malalaking sunglasses. Oh baka mas bagay sayo aviators! Talagang ini-aim ko talaga magsuot ng mga ganyan, I always feel uncomfortable kasi my shoulders are broad and ang laki ata tignan. Huhu you nailed this look, by the way. I love the top! Nakikita ko na ang susunod na Jelinne Catt.